The objective of this work was to investigate salinity tolerance on a large panel of triticale composed of 801 genotypes being chosen among the international collection. In 2006/2007 cropping season, the collection was grown in field pots at 10 dS m 1. Biomass and grain yields were equal to 57 and 8.5 g/pot, respectively. Multivariate analyses showed that 60% of the collection was suitable for grain production. About 134 genotypes (17% of the collection) were selected for 2007/2008 growing season, where the genotypes were grown at 5, 10 and 15 dS m 1. The second pot screening cycle showed that top genotypes performed 40 and 30% higher grain and forage yields, respectively, at 15 dS m 1 than average yields of the collection grown at 5 dS m 1. Whereas, high salinity level curtailed grain yield and forage yield of the whole collection by 38 and 35%, respectively. The two season's field pot screening allowed the selection of a nursery of 36 genotypes that were assessed during 2008/2009 season in field plots with three salinity levels: 5, 10 and 15 dS m 1 and three replications. The genotypes of the nursery differed at 89% for yield. At 15 dS m 1, only 22% of the genotypes exceeded target values of forage and grain yields of 5 and 2 t ha 1, respectively. Genotypes displaying stable grain and forage yields represented 16 and 41% of the final nursery. Stress-tolerance of Sinorhizobium spp. 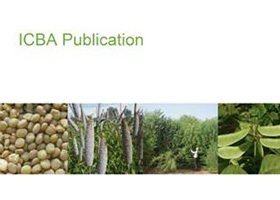 nodulating sesbania and cowpea in desert soils.